Because of Bobby Thomson’s dramatic “Shot Heard ’Round the World” in the bottom of the ninth of the decisive playoff game against the Brooklyn Dodgers, the team will forever be in baseball public’s consciousness. But of course there is much more to the story of that famous team than a dramatic home run (albeit the most famous and probably the most dramatic home run in baseball history) and sign stealing. After all, the team started the year 2-12 and found itself 13 games out of first place with a little more than six weeks left in the season. They soon peeled off 16 wins in a row and went 37-7 down the stretch to force the famous playoff. The ’51 Giants did win 97 games other than the game everyone remembers. The team is also of historic significance because of its role in the integration of baseball. It was the year Willie Mays first showed his brilliance to major-league audiences, in late May joining black teammates Monte Irvin, Hank Thompson, and Ray Noble. At the time, the Dodgers and Giants had most of the smattering of African-American players in the big leagues, and it is no surprise that those two teams battled down to the wire for the National League pennant. Fueled by Giants manager Leo Durocher, who had previously managed the Dodgers, the two teams simply did not like each other and they showed it. Beanballs, flashing spikes, and brawls and near brawls were the order of the day. It is, of course, a rivalry that endures today, with both clubs having moved to the West Coast in 1958. For any number of reasons, the ’51 Giants truly are the team that time won’t forget. It is the aim of this book to assure that to be true by providing an in depth look at and future resource about that historic team. Includes a foreword by Giants outfielder Monte Irvin, as well as biographies of all players, coaches, executives, and broadcasters. Also included are chapters on the Polo Grounds, recaps of notable games, the integration of the Giants, sign-stealing, the 1951 All Star Game, World Series, and more. Contributors: Eric Aron, Thomas Ayers, Matt Bohn, Terry Bohn, Maurice Bouchard, Bo Carter, Alan Cohen, Rory Costello, Nicholas Diunte, Alexander Edelman, James E. Elfers, Greg Erion, Charles F. Faber, Scott Ferkovich, Dan Fields, Jeff Findley, James Forr, Rob Garratt, Peter M. Gordon, Don Harrison, Tom Hawthorn, Dr. Lawrence Hogan, Monte Irvin, Bill Johnson, Jimmy Keenan, David H. Lippman, Jeffrey Marlett, Brian McKenna, Rob Neyer, Skip Nipper, Armand Peterson, Janice A. Petterchak, Joe Phillips, C. Paul Rogers III, John T. Saccoman, Curt Smith, David W. Smith, Lyle Spatz, Mark S. Sternman, Andy Sturgill, Rick Swaine, Judith Testa, Stew Thornley, Steve Treder, Clayton Trutor, Gregory H. Wolf. E-book: Click here to download the e-book version of The Team That Time Won't Forget: The 1951 New York Giants for FREE from the SABR Store. Available in PDF, Kindle/MOBI and EPUB formats. Paperback: Get a 50% discount on The Team That Time Won't Forget: The 1951 New York Giants paperback edition from the SABR Store ($15.99 includes shipping/tax). E-book: Click here to purchase the e-book version of The Team That Time Won't Forget: The 1951 New York Giants for $9.99 from the SABR Store. Available in PDF, Kindle/MOBI and EPUB formats. 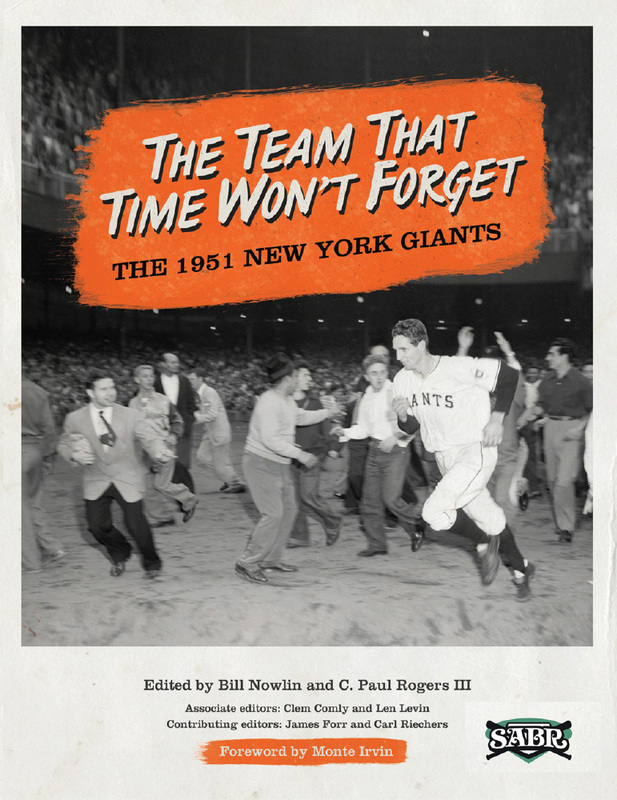 Paperback: Get the paperback edition of The Team That Time Won't Forget: The 1951 New York Giants from the SABR Store ($30.99 includes shipping/tax). This page was last updated October 31, 2017 at 7:19 pm MST.